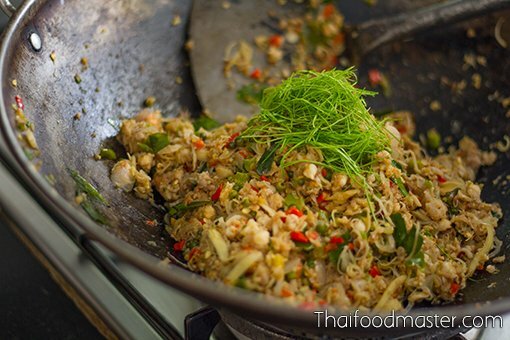 The use of fermented fish flourished for thousands of years in Southeast Asia, with the optimal proportions of each ingredient in the process adjusted by generations of producers to create the best taste and smell possible. Each region has created a slightly different product. 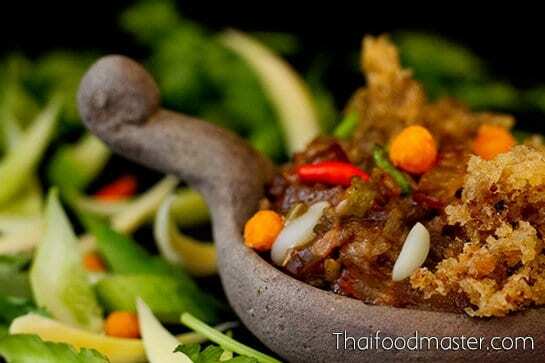 Mom Rajawongse Kukrit Pramoj, a scholar and a food guru, as well as a former prime minister of Thailand, said that the areas using fermented fish today overlap the reach of the Dvaravati Kingdom (6th-13th centuries). Some claim that this ancient Khmer-Mon kingdom was the lost Kingdom of Suvarnabhumi, (สุวรรณภูมิ), the land of gold believed to be located beyond the Ganges, under the rising sun itself. 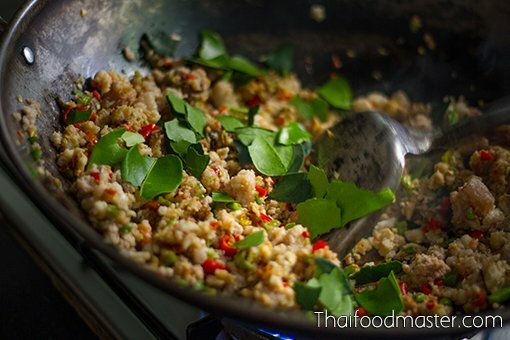 Indeed, fermented fish is more than just a food: it is intermingled with the culture of the Northeast and the Northern part of Thailand; is well known in the central regions of Thailand among the Tai-Lao ethnic groups; and even in U-Thong and Ayutthaya, in the low lands and the river banks where vestiges of the Dvaravati culture, along with proximity to rivers and an abundance of fish, makes the use of fermented fish common. 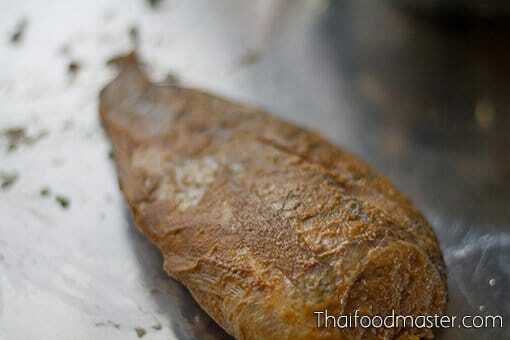 Fermented fish is also found in Tai-Lao literature. For example, Thaao Gam Phraa (ท้าวกำพร้า) is a folk story depicting the tales of a disabled fermented fish merchant who, after many struggles with the monarch and with spirits, eventually wins the heart of the princess and later ascends to the crown himself. The ghost dance ceremony of Fawn Phee Meng (ฟ้อนผีเม็ง,) is a tribute to the ancestral spirits of the family, who are living with the family under the same roof and are responsible for protecting children and grandchildren. Of Mon origin, this ceremony is common among the Thai-Lao communities in the Northern Thai provinces and is celebrated over two days. 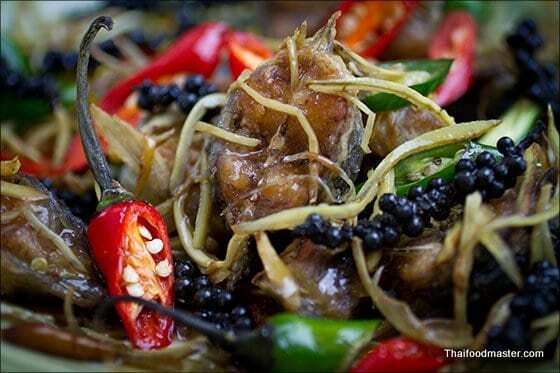 It is believed that the meng spirits love fermented fish (meng naam haa, เม็งน้ำฮ้า), therefore fermented fish is placed inside bamboo, or various fermented fish dishes are cooked as offerings, such as gaaeng bpuh (แกงเปอะ) and gaaeng dtohm bplaa raa (แกงต้มปลาร้า). 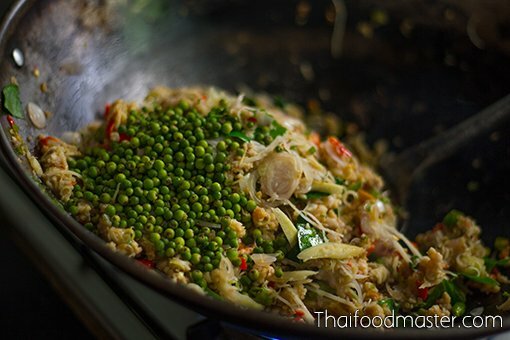 Recipes using fermented fish appear in nearly every Siamese or Thai cookbook. 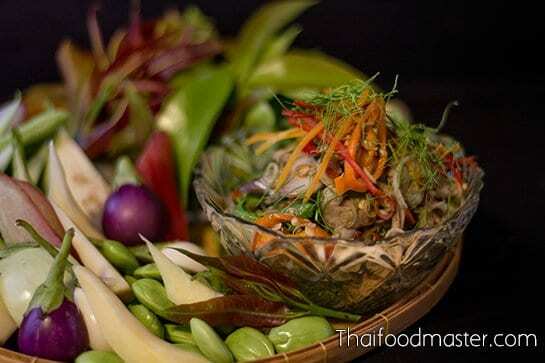 Thai people from all walks of life enjoy fermented fish. In Northeastern Thai cuisine (Issan), fermented fish is used in almost all the savory dishes and, in some cases, it’s the major ingredient. Nobility and Royalty, including the King himself, are also fond of fermented fish. 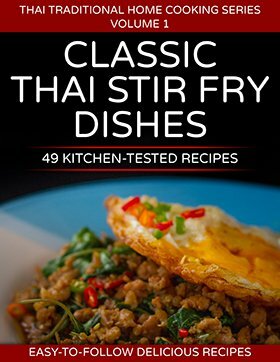 When King Rama V unofficially visited the old strongholds of the Ayutthaya period – Ang-Thong, Singburi, Muang-In and Muang Prom, cities that required two days of travel from the capital – he relished the many specially prepared dishes and local favorites made of, or containing, fermented fish. 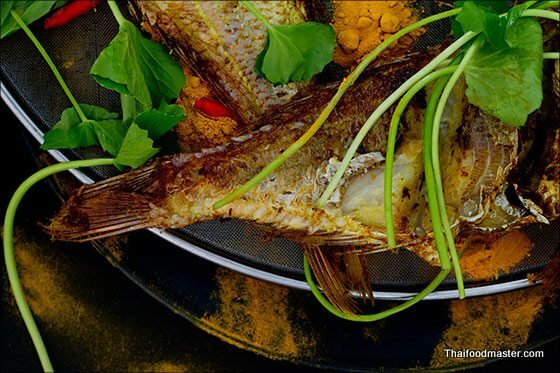 Today we will present the recipe for fried fermented fish relish with grilled catfish, pork and shrimp (ปลาร้าผัดทรงเครื่อง) (bplaa raa phat sohng khreuuang), from the recipe collection Saai Yao Wa Phaa. This collection was prepared for Princess Yaovabha Bongsanid’s funeral in 1934 by members of her family, as well as civil servants and teachers from the Saipanya Rangsit high school. Princess Yaovabha Bongsanid (1884-1934) was the daughter of King Rama V and the Noble Consort, Mom Rajawongse Nueng Sanitwong. Together with her brother Prince Rangsit Prayurasakdi, Mom was raised in the Grand palace by Queen Savang Vadhana after her own mother passed away. 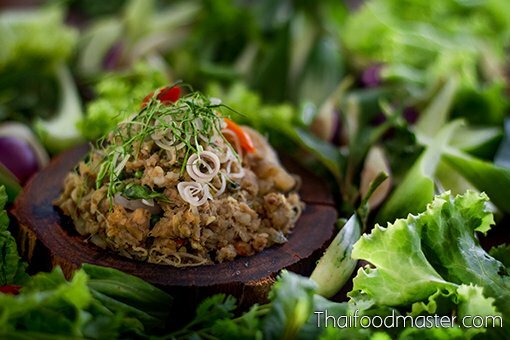 This relish of fried fermented fish is a dish from the central plain of Thailand, in which fermented fish is, of course, a major ingredient. 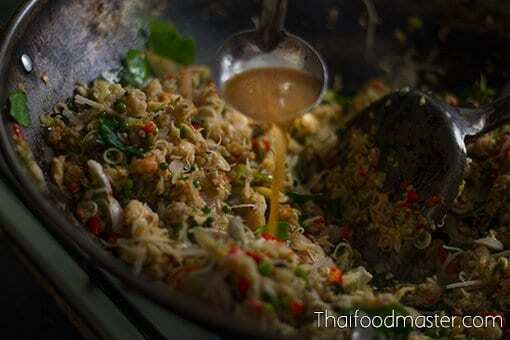 It is usually made from a large fish fermented whole with roasted ground rice and salt, preferably snakehead fish or catfish – or even both. 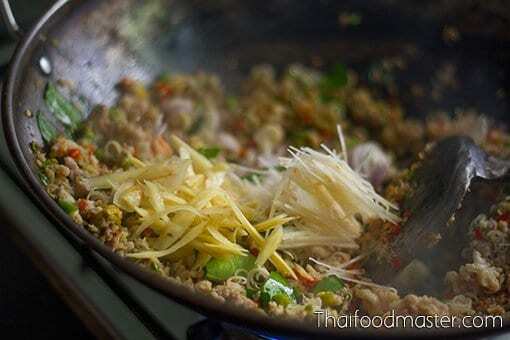 The fish meat is separated, minced and fried alongside other meats. 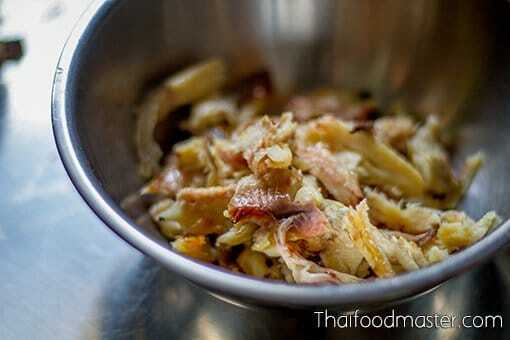 Here we use a combination of four: fermented fish, grilled catfish , pork belly and minced shrimp. We will fry the four types of meat in pork lard, and when it is cooked we will add large quantities of aromatic herbs that will render the dense umami flavor core a bit lighter, and give it a pleasant aroma. Kaffir lime juice will add just a hint of sourness, serving as a flavor binder with the fresh vegetables served alongside. 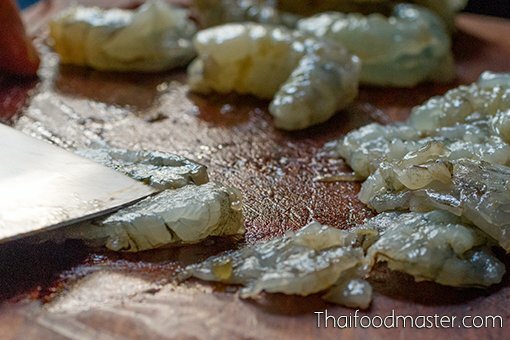 Not every aromatic is compatible with the strong fermented fish smell: those that work harmoniously and are in common use include galangal, lemongrass, fingerroot, kaffir lime leaves, shallots, garlic and chili. Other aromatics are fresh peppercorn, galangal flowers and the turmeric plant. 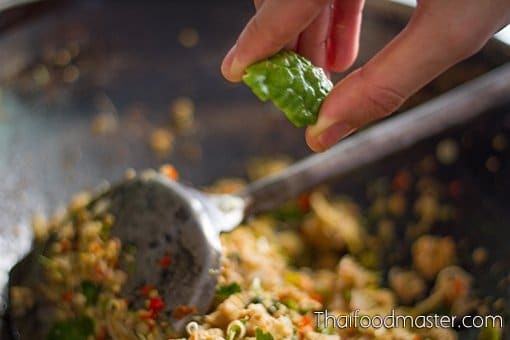 From examining the many recipes for this dish, it emerges that only tamarind paste and kaffir lime juice are used to add sourness to the dish – never lime juice or any other citrus fruits. While we don’t know the reasoning behind it, we trust the ancient Siamese wisdom that, through practice and experimentation, guides this practice. This relish is also never seasoned sweet with sugar; in rare cases, some Royal recipes add a drop of honey but generally the entire sweetness of the dish comes from the natural sweetness of the meat, and from fermented rice (khaao maak, ข้าวหมาก), coconut cream or the side vegetables used for dipping. This relish is labeled in Thai as sohng khreuuang (ทรงเครื่อง), to indicate the use in excess of ingredients that make a dish richer than usual. 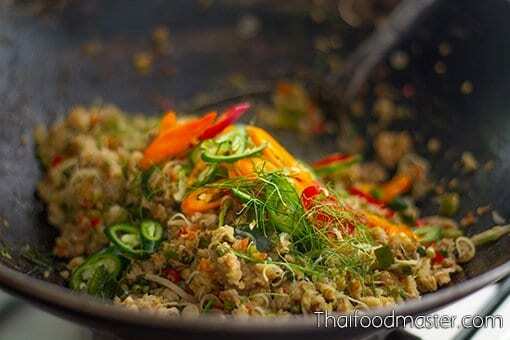 This recipe is from the Saai Yao Wa Phaa collection (สายเยาวภา). This relish is labeled in Thai as sohng khreuuang (ทรงเครื่อง), to indicate the use in excess of ingredients that make a dish richer than usual. Assortment of fresh vegetables such as fresh small eggplants, cucumber, rose apple, white turmeric, coriander, morning glory, Vietnamese coriander, Thai basil, green mango and yard long beans. Charcoal grill a whole catfish over low heat until dry. The process is described here. Remove the meat from the fish; discard the skin and bones. 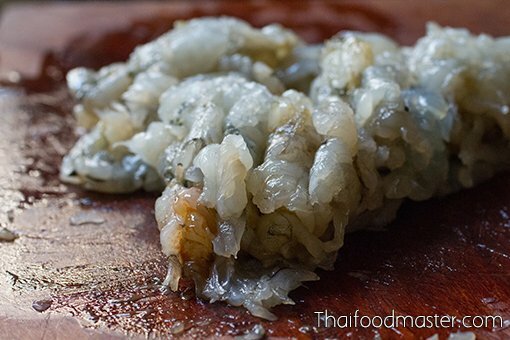 Fermented fish; the ground roasted rice used in the fermentation is seen as a brown paste on the fish. 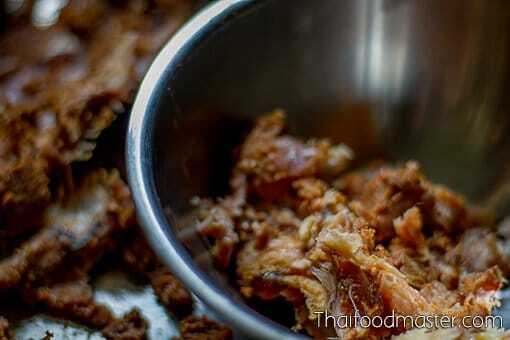 Remove the meat from the fermented whole fish; discard the skin and bones. 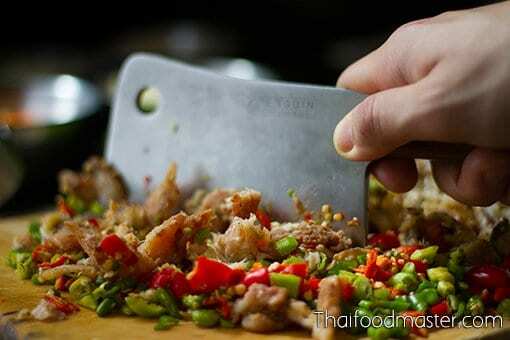 Using a knife, mince the pork belly. Set aside. 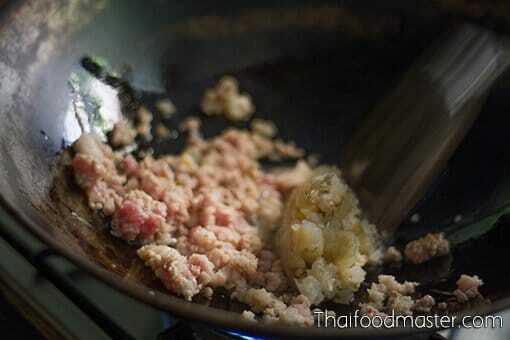 Using a knife, mince the shrimp and set aside. 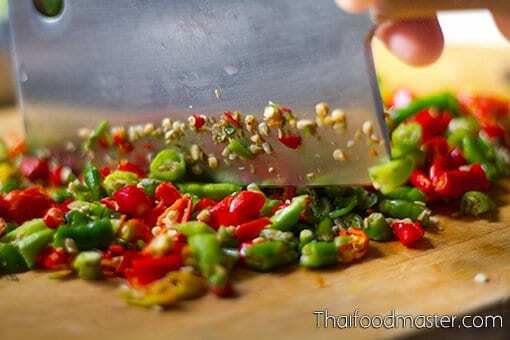 With a heavy knife, chop fresh bird’s eye chilies with fresh Karen chilies. 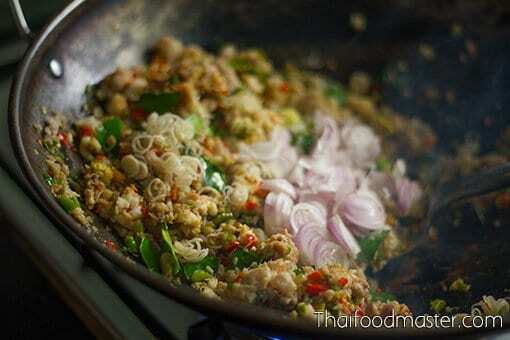 Add the fermented fish meat and grilled catfish meat, and mince together with the chilies. 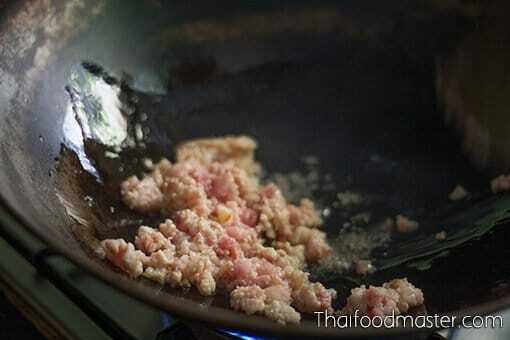 Set a wok with pork lard over medium-low heat; add the minced pork and fry until done. 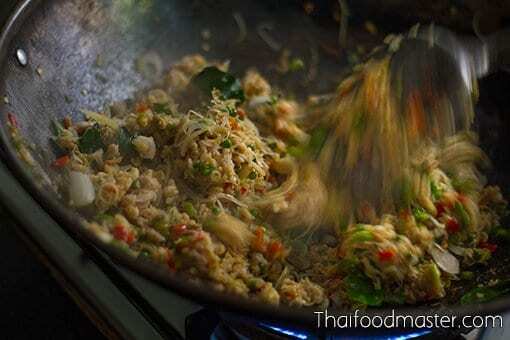 Add the minced shrimp meat; continue to fry. 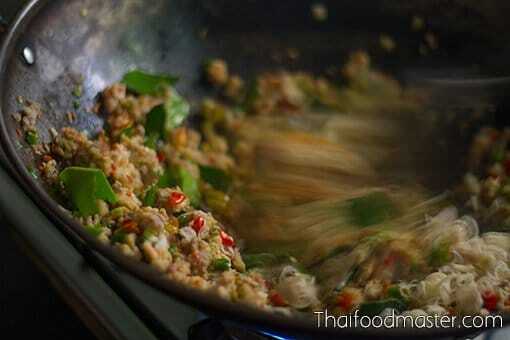 Add the minced fish and chilies. 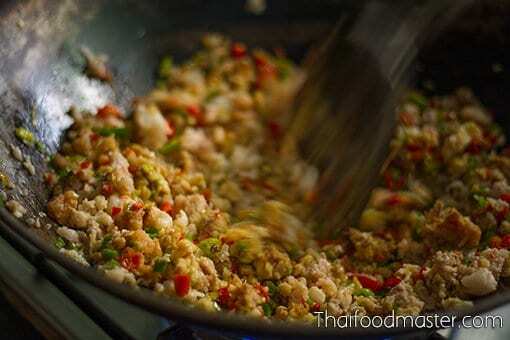 Keep stir frying everything together. Add young galangal and julienned fingerroot (and galangal flowers if used). 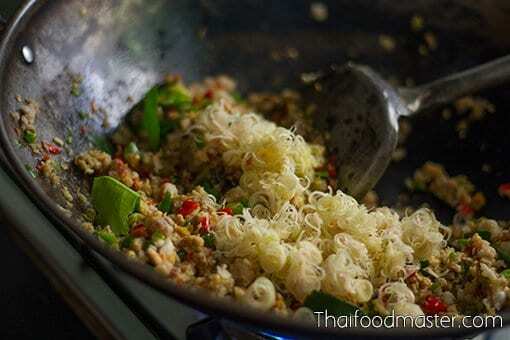 Add hair-thin julienned kaffir lime leaves. Add chilies in three colors.